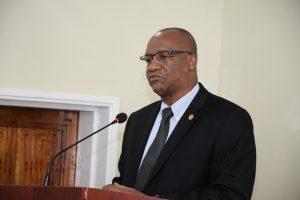 Basil Williams vs Joseph Harmon for PNCR Chairmanship? Chairman of the People’s National Congress Reform (PNCR), Basil Williams on Monday said the members of his party will determine whether he returns to the number two spot of that political party. Party sources have indicated that Joseph Harmon is interested in the number two post of that party. 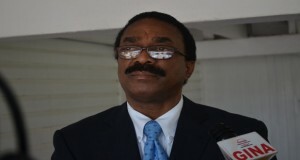 Harmon has already declined to comment on his availability for the PNCR Chairmanship when his party’s Congress is held in August of this year. Harmon, who is also Minister of State, is said to be interfacing a lot with the PNCR’s North American Region (NAR) in recent weeks. Williams was asked whether he would be accepting nomination for the position of Chairman. In response, he said “when the time comes” and added that he is servant of PNC members on whom he would be relying. “Our members are very intelligent people and the type of leadership that they require, they know,” he said. Asked if he was confident that he would win the Chairmanship again, he said “I have always been a confident person in my make-up, as a lawyer, as a minister…”. Williams, a long-serving active PNCR member dating back to the 1980s, also remarked that, “I am servant of the PNC and a servant of my party. They know me. I have been working steadily throughout the years and me and my comrades so we don’t think that’s an issue,” he said. Several party sources indicated that even if Williams’ performance in the party has not been entirely satisfactory, once he gets the endorsement of the machinery it will be virtually impossible for Harmon,a retired Lieutenant Colonel, to win. There is also a lingering concern in some PNCR quarters about allowing ex military personnel to take over the leadership of the party and leaving out those who have rallied behind that political organisation for decades especially while in opposition.